These go perfectly with our recipe for Cupid’s Brew: Check it Our HERE. 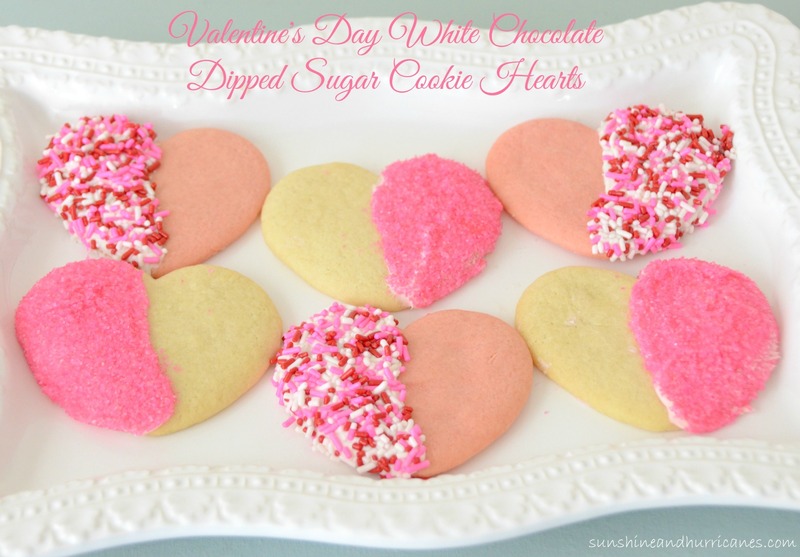 Looking for a really simple and yet oh so yummy Valentine’s Day treat? 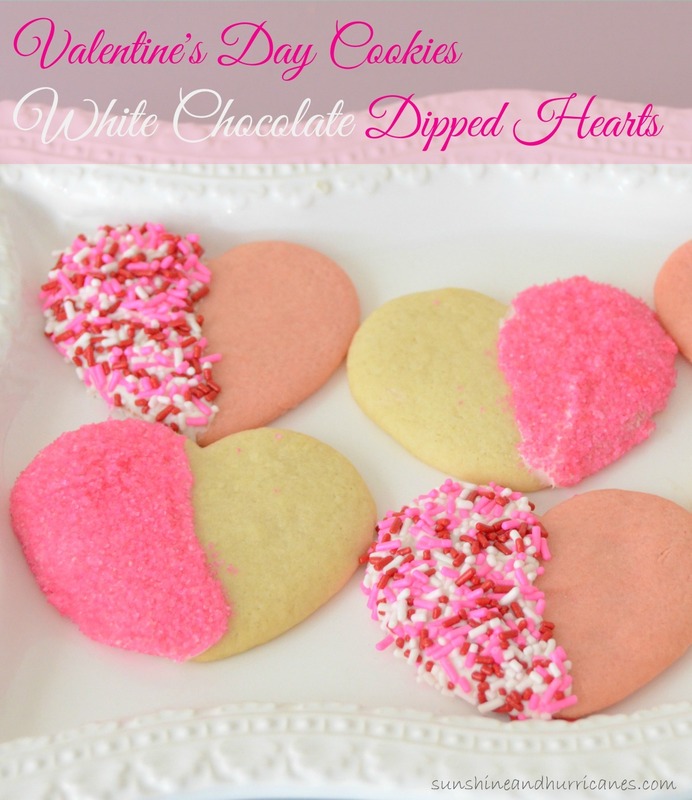 These White Chocolate Dipped Valentine’s Day Cookies are adorable, taste delicious (thank you white chocolate) and are E-A-S-Y to make. You can start one of two ways. Use either pre-bought sugar cookie dough or a boxed sugar cookie mix (just following the direction for cut-outs) OR you can use our Simple Sugar Cookie Recipe. Once you’ve got the dough prepared, divide it into two bowls and add just a few drops of red food coloring to one bowl and mix in until you get a nice pink color. 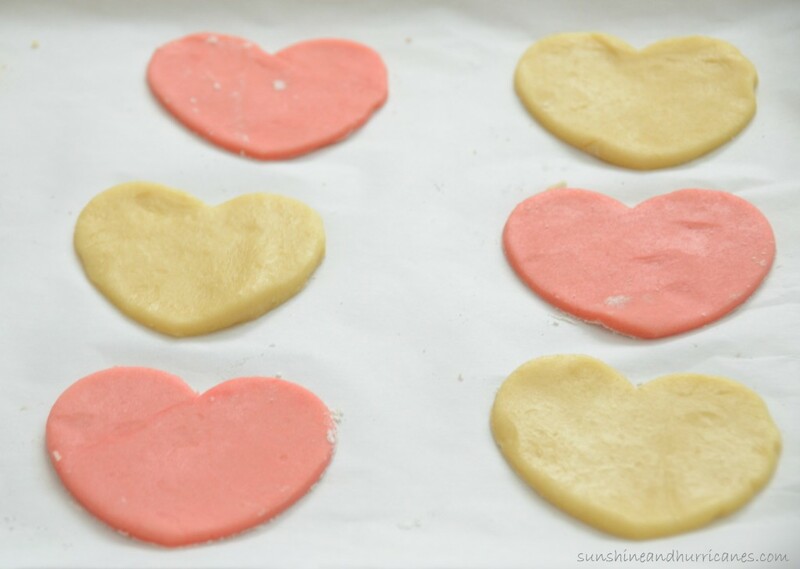 Roll-out one color dough at a time and use a heart cookie cutter to make the shapes and then place them on a cookie tray and bake according to the directions of the cookie mix you used. Let the cookies back and fully cool. During this time, you can pick your sprinkles and place a good amount on separate plates so it will be easy to press the cookies in once they’ve been dipped in the chocolate. To prepare the white chocolate for dipping. Combine 1 cup of high quality white chocolate chips with a tsp of coconut oil or vegetable oil and place in the microwave on 50% power for 30 seconds. Take out and mix for a minute. Melting chocolate in the microwave is a bit tricky, b/c if you over do it then you end up with this weird chunky chocolate mix. NOT GOOD. So take it slow and if after 30 seconds and a good mix, if it’s still not fully melted, put it back in the microwave in 10 second increments, stirring after each ten seconds. When the chocolate is melted, dip one side of the cookie in the melted chocolate and then press the cookie into the sprinkles, covering the chocolate as completely as possible. Place back on the cookie sheet to let the chocolate and sprinkles set. Repeat until you’ve dipped and sprinkled all the cookies. If the chocolate begins to harden during this process, just pop it back in the microwave for about 5 seconds and re-stir. These cookies keep well for several days in an air tight container. Looking for another sweet treat for Valentine’s Day? How about some Yummy Valentine’s Day Chocolate Bark!!! Also, be sure for follow our Valentine’s Day Pinterest Board for other ideas you are sure to LOVE! Follow Sunshine and Hurricanes ‘s board Valentine's Day on Pinterest. these are so perfect and pretty for valentines day! I was just reading about Valentine’s Day ideas for couples on Alli’s blog. She mentioned having a couples bake off. I could so do the bake off with these cookies. I love white chocolate and decorating the cookies will be fun. these are so CUTE I want to eat them ALL!! These are so cute! I love valentine’s day for all the delicious treats people make! these are adorable and so fun. i may have to surprise my man with this fun cookies! thanks for sharing! Your Valentine’s Day cookies are so cute I love them pink and dipped in chocolate and sprinkles would make my daughter happy (and me too! ).